Departure from Quito or Guayaquil to San Cristóbal (2 hours flight). Passengers are picked up at the airport by our naturalist guides and taken on a ten minute bus drive to the pier to board the M/Y Corals. conservation programs. Passengers will also have the opportunity to visit the port village, have a drink or shop for arts and crafts and other souvenirs. 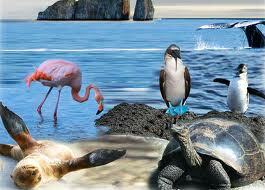 snorkeling, where a good range of sea birds can be observed. will see Darwin finches, mockingbirds, and White-checked Pintail. There’s also a lagoon where Flamingos can occasionally be seen. half of the trail is partially uneven terrain, comprised of volcanic basaltic rock that lounges the shoreline. Night Heron and astounding array of marine wildlife including lobster, starfish and marine iguanas grazing on algae beds alongside Sally Lightfoot Crabs. Colonies of endemic fur seals swimming in cool water pools formed by volcanic rocks. Snorkeling here offers rarities such as octopus or squid. believed to have been formed during the last quarter of the 19th century. Dry landing. We will reach the Santa Cruz highlands and visit a private farm, Primicias (El Chato), where giant tortoises are found in their natural habitat. The road to the reserve is one of the best places to observe land birds. Tree and ground finches, vermillion flycatchers and Cattle Egrets inhabit the area. Disembark at docks in Baltra, transfer by bus to the airport for flight back to Quito via Guayaquil.